To provide a better way for facilities operating within an IP fabric to orchestrate live IP flows, at IBC EVS launched a new broadcast control application, S.CORE Master. The new system gives engineers better visibility of all end points within an IP-connected network and acts as its central orchestrator, guaranteeing the delivery of bandwidth-demanding media throughout the infrastructure. IBC TV’s live workflow saw S.CORE Master in action as it became an all-IP production for the 2017 edition of the show. The system was installed in the workflow’s media data centre situated on the EVS stand in Hall 8. It played a key role in the workflow, enabling engineers to orchestrate IP flows and guaranteeing the bandwidth for live routing across IBC TV’s network which was split across three locations – the conference halls, master control room and the data centre. At IBC SVG Europe sat down with Global Marketing & Communications Manager Sebastien Verlaine to learn more about this significant more into the IP infrastructure world by EVS. “S-Core Master is part of our IP for Live strategy. We have a lot of EVS equipment that is used as end-points within networks. At first we thought we should partner with different people that are specialised in IP networks – and of course we have collaborated strongly with Cisco and Arista in that regard,” said Verlaine. “But we quickly found out that we needed a little more in terms of the broadcast controller that we wanted to put in place. That’s why we got more involved; and as we’re trying to make some of our legacy technology more IP-enabled, such as the XT 4K server supporting the SMPTE 2110 IP standard, these are different initiatives that brought us this thinking. “IP is a fantastic enabler but you need to add a layer to make IP broadcast-aware,” he said. “Basically the S-Core Master is IP routing for live production that enables the users to have more control over the nodes or devices that are connected to the network. Then we also use SDN methods to manage the bandwidth, so that the flow of media through the network is working efficiently and to the needs of those that are in the live production world. “A lot of people talk about IP in terms of benefits for production; but live production is a bit different and has its requirements, and people that are working in that area don’t always have the knowledge that they would have from the SDI world. 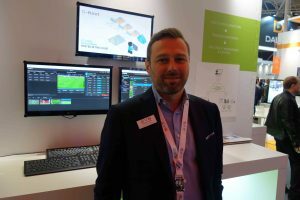 We’re seeing this now with IBCTV here at the show; operators are – not reluctant, at least not the younger ones – but they’re under pressure to make sure everything works,” said Verlaine. “So with S-Core Master, on top of the layer that orchestrates everything you need a simple interface that allows those who are accustomed to working in live broadcast to recognise certain flows that were familiar back in SDI and are now in IP. That’s really the whole concept and approach that we’ve been taking. You can’t chase packets in the [established] broadcast-centric way. S-Core Master is a glue to make the IP network act as a broadcaster expects,” he said. “When you’re talking about a large production (such as an IBC for a sports tournament), to be able to manage all of that requires a certain system that can orchestrate and control. We have that experience in the live production environment and we want to make sure that if we come up with something, it works and people can rely on it,” continued Verlaine. “We’re also taking a very pragmatic incremental approach, because we don’t want to over-promise. We’ve been working with IP flows for many years, for instance in big competitions like the FIFA World Cup or the Olympics. Now this is taking it to another level. “Customers are worried: they don’t want to have to change all their infrastructure just because everybody’s talking about IP. That represents quite a lot of investment. There are benefits to IP that will reduce costs and create efficiencies; but in the meantime you still have to make that investment. You want a clear picture: will the systems you invest in now be the same as those that come along two or three years from now?” said Verlaine. Completely interoperable with third party systems, S.CORE Master will initially be made available to operators on a standard EVS backend app server. This enables simple integration into live IP workflows and enables users to control the system via a web browser-based application. As well as managing live IP flows, S.CORE Master will also enable operators to monitor IP-enabled networks and service aspects of the facility to maintain the system’s guarantee of efficient delivery of live content around the live production infrastructure.